One of the many reasons to opt for a motorcycle is to able to squeeze through traffic. Passing in between the narrow gaps between cars is a feat typically reserved for smaller scooters and underbones. However, there is one exception to rule, the Honda CBR 150R. This Honda boasts of styling that closely resembles the Japanese company’s flagship model – the CBR 1000RR, albeit in petite packaging. As sporty as it may seem, the CBR 150R’s riding position has just the right compromise between track day fun and everyday riding practicality. I bet that riding this bike on long hauls during the weekend won’t be a back-breaker. Honda Philippines, Inc. had generously handed me the keys to this gorgeous black CBR 150R for two weeks to review. During its time with me, I used this bike to fetch my son to and from Manila from my home in Cavite. One can imagine it’s a very long ride, involving roads with some of the heaviest traffic in Metro Manila. Nonetheless, it was made easy, thanks to the bike’s narrow, 690 mm handlebar. (*Phone mirror mount courtesy of Bikerbox, Inc. Not included with Honda CBR 150R). As opposed to a standard bike’s 750mm handlebar, the sporty handlebar of the CBR is much narrower by comparison, making it perfect for squeezing through even the tightest traffic, particularly that of Taft Avenue. Some might ask, “How about the side mirrors?” Well its side mirrors only measure 801 mm, as opposed to 860 mm on a standard motorcycle. Paired with a height of 1,880 mm tall, puts it much lower than a typical car’s side mirrors. Granted, the CBR is a sport bike, and designed for more sporty riding. The 149 cc powerplant of enjoys revving in the high RPMs. Despite being built for revving, it still returns some decent low range grunt, desirable when squeezing through traffic. I never experienced any stalling. While riding in the city, I was able to burn a convincing 46 kilometers per liter at best with my “normal” riding style. Upon riding with occasional horseplay, my fuel economy with the CBR 150R dropped to 43 kilometers per liter, which is still very impressive. I even thought at one point that the fuel gauge was malfunctioning because it never seemed to drop a bar. For a performance bike, it handled traffic so well, as I hardly recall the radiator fan turning on, or perhaps its was really quite. Engine temperature felt pretty consistent. As with most if not all Hondas, clutch pull is very light. I was even using one finger to pull the clutch most of the time. 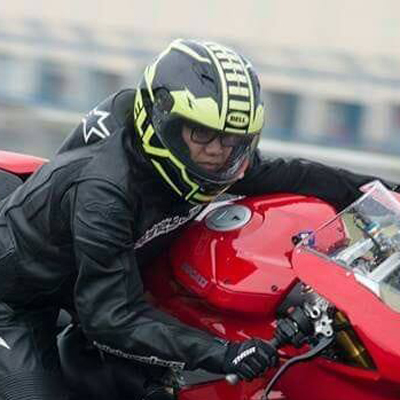 With its PhP 152,900 price tag, it would be much appreciated if this motorcycle was equipped with an Anti-lock Braking System (ABS) straight from the factory. With motorcycles models like these selling like hot pandesal especially to newbie riders, ABS might be the difference between life and death. And if I may add, the little creature comfort of a USB charger might be a good idea, too. It’s not that big a deal considering that a lot of these USB charger units are readily available as aftermarket and plug-and-play. I also think that this bike would be well suited for female riders. It’s not intimidating at all, considering its low 787 mm seat height and the smooth power delivery. All told, the CBR 150R is a good buy. Its fuel efficiency and handling is perfect for any rider who wants a motorcycle that can do it all: a motorcycle for everyday use and weekend out-of-town rides with his riding group. We test ride one of the newest entries in the market, the highway-legal Bristol Classic 400i.